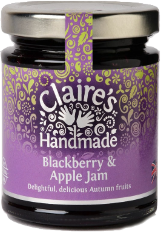 The simple blend of gorgeous dark, sweet blackberries and sharp Bramley apples makes every morning a celebration of flavour. This jam is perfect for warming and spooning over pancakes or waffles. Transforms a steamed sponge when added to the bottom of the bowl before cooking. Allergens in CAPITALS. Sugar, Bramley apples 25%, blackberries 20%, gelling agent: fruit pectin, acidity regulator: citric acid. Prepared with 45g fruit per 100g. Total sugar content 63g per 100g.